Hello dear friends, This is Gayatri here today sharing with you a card using the new Scenery: V for CheVron stamp set. The inspiration for this card came from a skirt from a catalogue of a store in Australia called Myer. Here is the picture of the skirt for you. I love the collage of chevrons on the sketch especially the neon colours. Now I tried to create a bit of chevron collage on my card. Here is my card. I simply stamped the outline chevrons diagonally, then stamped the solid chevrons using neon inks. I stamped the solid neon chevrons randomly to give a collage effect. I only wanted a bit of the collage on the card with a lot of white to give a big impact. Then I used the Bubble Talk stamp set to stamp the solid speech bubbles, stamped the sentiment, cut them out and layered them on the outline speech bubble stamped on the panel. Finally used black enamel dots to finish off the card. I mounted the panel on the card front using foam adhesive for some dimension. Although my inspiration came from a skirt, I channelled my inspiration to make a funky boy’s card. 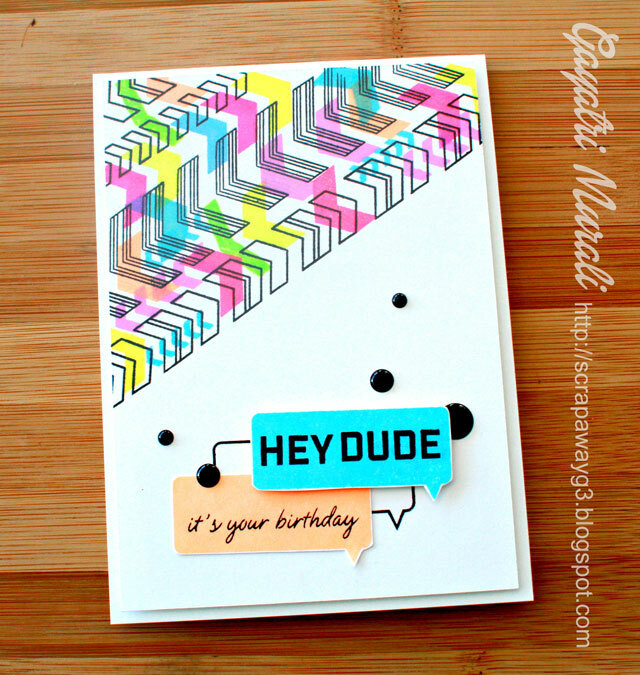 Hope I have inspired you to try some funky neon chevron collage masculine card. Love the trendy design, gorgeous inspiration from the picture!!!! This is so cool! 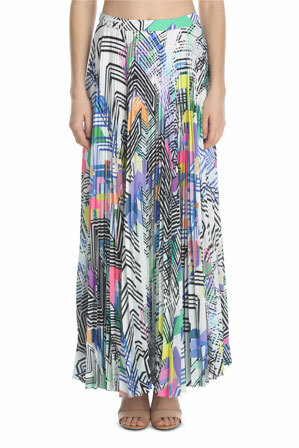 Its almost identical to the skirt. I love the bright colors! Love this!! The colors are wonderful. Gonna have to give it a try. I love my Chevron stamp set! Great trendy chevrons and just love the neon. Fabulous card Gayatri! Love the colours - now I know I need this stamp set! Love those neon colors. Just the right balance of white. Great birthday card. Spectacular! I wish I'd thought of that! lol! I love this...such a neon fan! 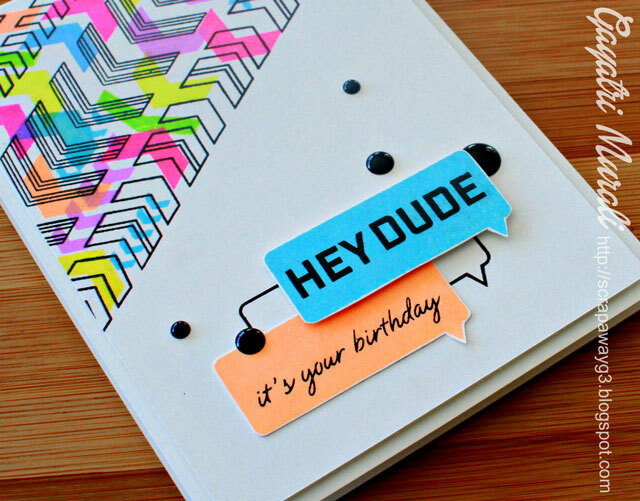 LOVE your inspiration and your card Gayatri!!! Your overlapping chevrons and colour combo looks TOTALLY AWESOME!!! So fun, colorful, and cool! Great balance of the neon collage stamping and white crisp card! Love it!